Most unshielded twisted-pair (UTP) and screened twisted-pair (ScTP) cable installations use patch panels and, consequently, 110-style termination blocks. The 110-Block contains rows of specially designed slots in which the cables are terminated using a punch-down tool. When terminating 66-blocks, 110-blocks, and often, wall plates, both UTP and ScTP connectors use IDC technology to establish contact with the copper conductors. You don’t strip the wire insulation off the conductor as you would with a screw-down connection. Instead, you force the conductor either between facing blades or onto points that pierce the plastic insulation and make contact with the conductor. Both UTP and ScTP cables use modular jacks and plugs. For decades, modular jacks have been commonplace in the home for telephone wiring. Modular connectors come in four-, six-, and eight-position configurations. The number of positions defines the width of the connector. However, often only some of the positions have metal contacts installed. Make sure that the connectors you purchase are properly populated with contacts for your application. F-connectors are commonly available in one-piece and two-piece designs. In the two-piece design, the ferrule that fits over the cable jacket is a separate sleeve that you slide on before you insert the collar portion on the cable. Experience has shown us that the single-piece design is superior. Fewer parts usually means less fumbling, and the final crimped connection is both more aesthetically pleasing and more durable. However, the usability and aesthetics are largely a function of the design and brand of the two-piece product. Some two-piece designs are very well received by the CATV industry. the jack and must be used if the center conductor is stranded instead of solid. The assembly is attached to the cable by crimping it in place. A screw-on collar ensures a reliable connection with the jack. The N-type connector is used with RG-8, RJ-11U, and thicknet cables for data and video backbone applications. Simplex connectors terminate only a single fiber in the connector assembly. Duplex connectors terminate two fibers in the connector assembly. Array connectors terminate more than two fibers (typically 12 or 24 fibers) in the connector assembly. 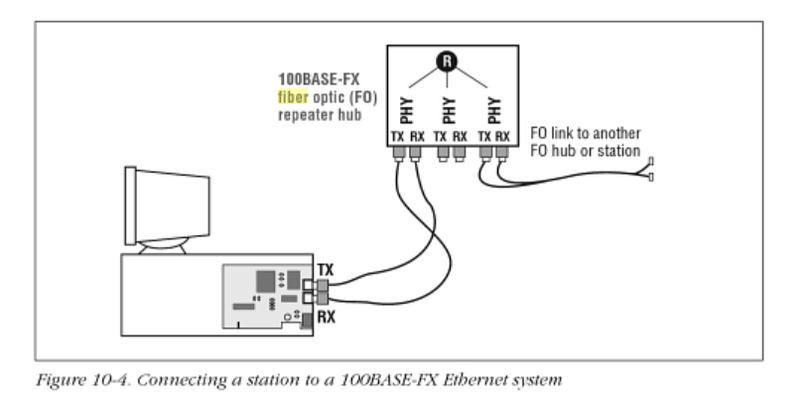 As transmission rates increase and networks require the cramming in of a greater number of connections, the industry has developed small-form-factor (SFF) connectors and adapter systems for fiber-optic cables. The SC, ST, and FC Connectors shown in Table 10.5 all take up more physical space than their RJ-45 counterparts on the copper side. This makes multimedia receptacle faceplates a little crowded and means that you get fewer terminations (lower density) in closets and equipment rooms than you can get with copper in the same space. The goal for the designers of the SFF connector was to create an optical-fiber connector with the same or lower crosssectional footprint as an RJ-45-style connector in order to increase the number of connections per area (higher density). The LC, the VF-45, and the MT-RJ SFF fiber-optic connectors were initially developed to support the increase in density of fiber connections. The LC Connectoris gaining greater use and is regarded by many optical-fiber professionals. Fiber connector has traditionally been the biggest concern in using fiber optic systems. While connectors were once unwiedy and difficult to use, connector manufacturers have standardized and simplified connectors greatly. This increases the user use convenient increase in the use of optical fiber systems; It is also emphasising taken proper care of and deal with the optical connector. This article covers connector basics including the parts of a fiber optic connector, installing fiber optic connectors, and the cleaning and handling of installed connectors. For information on connector loss, see Connector Loss Test Measurement. Optical fiber to fiber optic interconnection can be made by a joint, a permanent connection, or a connector, and is different from the plug in it can be to disconnect and reconnect. Fiber optic connector types are as various as the applications for which they were developed. Different connector types have different characteristics, different advantages and disadvantages, and different performance parameters. But all connectors have the same four basic components. The fiber is installed in a long, thin cylinder, the ferrule, which act as a fiber alignment mechanism. The ferrule is bored through the center at a diameter that is slightly larger than the diameter of the fiber cladding. The end of the fiber is located at the end of the ferrule. Ferrules are typically made of metal or ceramic, but they may also be constructed of plastic. Also known as the connector housing, the body holds the ferrule. It is usually constructed of metal or plastic and includes one or more assembled pieces which hold the fiber in place. The details of these connector body assemblies vary among connectors, but the welding and/or crimping is commonly used to attach strength members and cable jackets to the connector body. The ferrule extends past the connector body to slip into the couping device. The cable is attached to the connector body. It acts as the point of entry for the fiber. Often, a strain relief boot is added over the junctioni between the cable and the connector body, providing extra stength to the junction. Table 1 illustrates some types of optical connectors and lists some specifications. Each connector type has strong points. The method for attaching fiber optic connectors to optical fibers varies among connector types. While not intended to be a definitive guide, the following steps are given as a reference for the basic of optical fiber interconnection. Cut the cable one inch longer than the required finished length. Carefully strip the outer jacket of the fiber with “no nick” fiber strippers. Cut the exposed strength members, and remove the fiber coating. The fiber coating can be removed in two ways: a. by soaking the fiber for two minutes in paint thinner and wiping the fiber clean with a soft, lint-free cloth; b. by carefully stripping the fiber with afiber stripper. Be sure to use strippers made specifically for use strippers made specifically for use with fiber rather than metal wire strippers as damage can occur, weakening the fiber. Thoroughly clean the bared fiber with isopropyl alcohol poured onto a soft, lint-free cloth such as kimwipes. NEVER clean the fiber with a dry tissue. Note: Use only industrial grade 99% pure isopropyl alcohol. Commercially available medicinal and isopropyl alcohol is light mineral oil dilution water. Industrial grade isopropyl alcohol should be dedicated. The connector may be connected by applying epoxy or by crimping. If using expoxy, fill the connector with enough epoxy to allow a small bead of epoxy to form at the tip of the connector. Insert the clean, stripped fiber into the connector. Cure the epoxy according to the instructions provided by the epoxy manufacturer. Anchor the cable strength members to the connector body. This prevents direct stress on the fiber. Slide the back end of the connector into place (where applicable). Prepare fiber face to achieve a good optical finish by cleaving and polishing the fiber end. Before the connection is made, the end of each fiber must have a smooth finish that is free of defects such as hackles, lips, and fractures. These defects, as well as other impurities and dirt change geometry transmission patterns of light and scattered. Cleaving involves cutting the fiber end flush with the end of the ferrule. Cleaving, also called the scrible-and-break method of fiber end face preparation, takes some skill to achieve optimum results. Properly handled, the cleave produces a perpendicular, mirror-like finish. Incorrect cracks will cause the lips and the comb as shown in Figure 2. While cleaving may be done by hand, a cleaver tool, available from such manufacturers as Fujikura and FiberStore, allows for a more consistent finish and reduces the overall skill required. After clean cleave has been achieved, the fiber end face is attached to a polishing brush, and the fiber is ground and polished. The proper finish is achieved by rubbing the computerized fiber end against polishing paper in a figure-eight pattern approximately sixty times. To increase the ease and repeatability of connector installation, some companies provide the connector kits. Some kits are specific to the type of connector to be installed while others supply the user with general tools and informationi for connecting different types of connectors. Some connectors require the use of an alignment sleeve, also called an interconnection sleeve. This sleeve serves to increase repeatability from connection to connection. A number of events can damage fiber optic connectors. Unprotected connector ends can experience damage by impact, airborne dust particles, or excess humidity or moisture. Increase the optical output power of modern lasers may damage a connector, an often overlooked factor in discussions about handling and caring for optical fibers and connectors. Most designers tend to think of the power levels in optical fibers as relatively insignificant. However, a few milliatts at 850nm will do permanent damage to a retina. Today, optical amplifiers can generate optical powers of 1 watt of more into a single-mode fiber. This becomes quite significant when one considers that the optical power is confined in the optical core only a few microns in diameter. Power densities in a single-mode fiber carrying an optical power of 1 Watt (+30 dBm) can reach 3 megawatts/cm2 or 30 gigawatts/m2! To put it in everyday terms, sunlight at the surface of the Earth has a power density of about 1,000 Watts/m2. Most organic materials will combust when exposed to radiant energies of 100 kilowatts/m2. Clearly, power densities of 30 gigawatts/m2 deserve attention. Another important thing to remember in handling fiber optic connector is that the fiber end face and ferrule must be absolutely clean before it is inserted into a transmitter or receiver. Dust, lint, oil (from touching the fiber end face), or other foreign particles obscure the end face, compromising the integrity of the optical signal being sent over the fiber. From the optical signal’s point-of-view, dirty connections are like dirty windows. Less light gets through a dirty window than a clean one. It is hard to conceive of the size of a fiber optic connector core. Single-mode fibers have cores that are only 8-9 µm in diameter. As a point of reference, a typical human hair is 50-75 µm in diameter, approximately 6-9 times larger! Fiber optic connectors need to be cleaned every time they are mated and unmated; it is essential that fiber optics users develop the necessary discipline to always clean the connectors before they are mated. It is also important to cover a fiber optic connector when it is not in use. Never touch the fiber end face of the connector. Connectors not in use should be covered over the ferrule by a plastic dust cap. it is important to note that inside of the ferrule dust caps contain a sticky residue that is a by product of making the dust cap. This residue will remain on the ferrule end after the cap is removed. The use of index-matching gel, a gelatinous substance that has a refractive index close to that of the optical fiber, is a point of contention between connector manufacturers. Glycerin, available in any drug store, is a low-cost, effective index-matching gel. Using glycerin will reduce connector loss and back reflection, often dramatically. However, the index-matching gel may collect dust or abrasives that can damage the fiber end faces. It may also leak out over time, causing backreflections to increase. Looking at the current market can be described as quite a mixed bag of fiber optic connectors. On the premise of FTTH is popular, many companies has seen a market outlook. Have been started scrambling to grab market share. The market is very confusing, profits plummeted. Many enterprises in a dilemma. While operators central purchasing so many manufacturers were mixed, happy is the amount up, the worry is that the prices down, the market will be more difficult to do. At the cost of many manufacturers to reduce prices to squeeze into the operator’s Central Purchasing. How to choose a qualified fiber optic connector? Have to identify its selection, structure and production. A. Selection can be broadly divided into: Plastic V groove, rubber V groove, the metal V groove (copper or aluminum), the V grooves of quartz glass, pore and ceramic. Plastic V-groove is the most common manufacturers to adopt a selection, which is mainly because of the ease of processing, low cost. Subject to cost constraints, most manufacturers the production of plastic V-groove many are not using the new PEI fiber optic connector production materials, or even replaced by other inferior materials, in order to have gained a place the operators reserve price bid. Did not pay too much attention from the injection molding equipment, especially some small businesses and private small workshops, ordinary injection molding machine to produce. Short-term performance of the connector is not much of a problem, a long time under the influence of accident by environmental factors will be frequent. Furthermore plastic V-groove on machining accuracy inadequate by the material, injection molding equipment and the use of environmental impact prone to deformation of the warped; wearing fiber by fiber nearly 90 ° cutting surface, easy blowing debris into the internal contacts, causing the inside of the connector pollution caused by successive failed. This material is not worth mentioning, rarely appear on the market. Simply can not afford because of its environmental factors. The material used on the market mainly copper and aluminum. Both can not escape the fate of being oxidized, and the processing of varying accuracy, easy to produce dander damage fiber. Insufficient strength will deform. Especially aluminum V groove, after repeated open the internal compression deformation space becomes large, the gripping force becomes small, the impact on the fiber optic splice performance. This material V-groove is the use of PLC Splitter technology, industry recognized and recommended for use on site assembly type fiber optic connector internal connecting way. The main advantage of its very high machining accuracy, can be controlled in 1μ between. Fiber breakpoint between successive favorable attenuation in the hot melt comparable. And to wear fiber smooth and difficult to produce debris. No deformation, resistance to environmental performance is extremely strong. With respect to the error between the fiber diameter and the diameter of the pores, but it is a defect. Diameter optical fibers and optical fiber itself thers is error, combined with the pore itself there is error. Accumulated error is at least a 3-micron industry report 1μ, contact the loss of fiber contacts between the dislocation will be more than 0.2 dB. Nor due to contact between the fixed, the earthquake became its fatal flaw. Field fiber optic connector is not PLC splitter. Optical Splitter by the factory processing, the handing of its internal contacts are in the operating microscope to ensure that its internal pollution. And assembled on site fiber optic patch cords, need to respond to the very harsh environment of the construction site. In this context, bear the brunt of the factory production environment. You may understand the PM2.5 particles of dust in the air everywhere. Superior production environment is a necessary prerequisite for the production of connectors, on this basis, also need refinement of each production. So as to ensure the production of fiber optic connectors have been qualified. This is why some manufacturers out connector at room temperature, a passing rate of about 90%, and some manufacturers can do more than 99% of the one-time pass rate. I believe that do the points above, but the factors used in the actual environmental conditions is very important. Do not just look at the room temperature performance, not just blindly concerned about the price. A qualified and superior fiber optic connectors must be able to withstand a long time in the harsh environment performance online, do not be confused by the immediate moment. It is worth mentioning here have been some manufacturers have begun to study the next generation of fiber optic connected to the cold continued transmission mode, so that the optical and the optical transmission between points. Such technology would ban docking between the fiber break dependence on fiber matching cream. And does not require professional support construction tools, can achieve real store of, so that users can do-it-yourself operation, like changing a light bulb so simple and quick.